Welcome to MyHealthOne. Your health information has been centralized here, on our secure, online health portal. Find A Doctor enables you to search across our network of available providers. Once you’ve found a doctor, Make An Appointment allows you to book an available appointment time (with select providers). Classes and Events lets you search our network for available classes and events. You can register for a class or event, pay for the class or event, and receive a registration receipt and confirmation email. 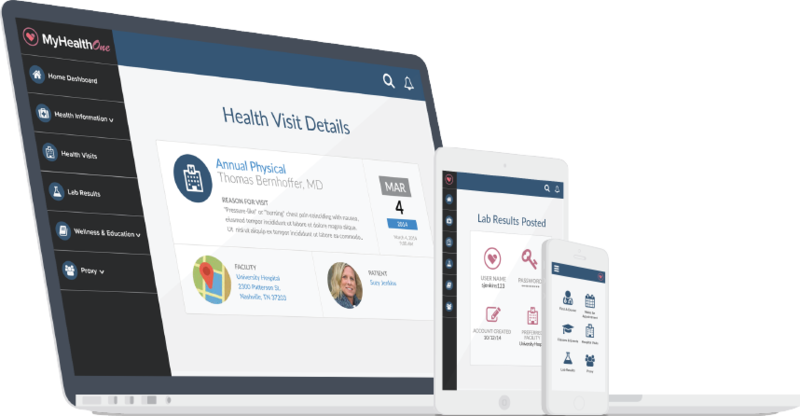 Manage your health by viewing hospital visits, hospital lab results and your health profile. You can also pre-register for hospital procedures, pay your hospital bills and manage the health of your loved ones. Some reports previously available in our hospital’s patient portal are not available in the first release of MyHealthOne. These include diagnostic imaging and radiology reports.